The name Jamrach doesn't mean much to most Londoners these days, but if you'd muttered those two words in 19th century London, it would have conjured up images of tigers, elephants and other exotic creatures. 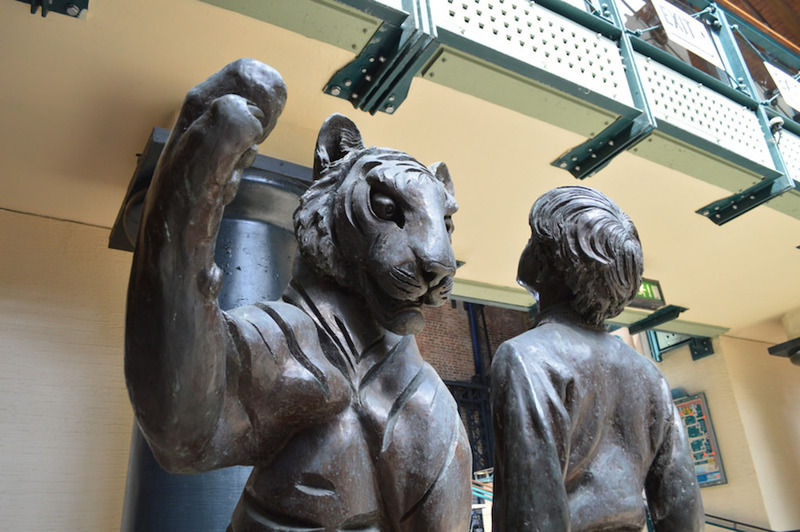 If you have heard of Jamrach today, it's probably to do with a tiger that made a bid for freedom in Wapping in 1857, taking with it a nine-year-old boy (who was later released, largely unharmed). Today, a statue in Tobacco Dock (above) commemorates the occasion. Jamrach was a well-known trader of exotic animals in 19th century London. He made his fortune buying animals brought back to London by sailors and travellers, and selling them on to wealthy clients, for whom they were primarily a symbol of wealth and status. His father Johann Jamrach, a harbour master, had already established an animal trade business, using his access to the exotic animals coming off the boats in his harbour. Charles, born in 1815, followed in his footsteps, and began dealing in bird skins and shells. In 1839, his brother Anton moved to London to establish his own animal trade business but died soon after arriving, leaving Charles to take over the business. The younger sibling ran his exotic animal business for over 50 years, at first employing runners to get down to the ships first to get the pick of the creatures being unloaded. Sailors often brought back unusual animals from their travels to sell them on to dealers such as Jamrach. As his reputation grew, more people came to him with requests for specific animals. Elephants, parakeets, toucans, armadillos and, of course, tigers, were just some of the animals he dealt in. The trader also built up relationships with London institutions such as the Natural History Museum and Zoological Gardens (now London Zoo). When his business premises were full, the Zoological Gardens would often let him store overflow creatures there. If the animal was a success with visitors, the zoo would buy it. Among Jamrach's customers were artist and poet Dante Gabriel Rossetti, who purchased his much-loved wombat, Top. Other customers included Lord Walter Rothschild, Lord Derby and Frank Buckland. Many animals unaccustomed to the British weather and diet didn't last long once they arrived — if they made it off the ship alive — so Jamrach developed a sideline dealing to taxidermists. Jamrach died in 1891, and his business was taken over by his son, Albert. Several factors including wars and the increased focus on animals for scientific research led to a gradual decline in the business. Jamrach's business had three main locations in London. Jamrach also owned a warehouse in Old Gravel Lane, Southwark, a road which no longer appears to exist, but seems to have run from the Thames to St George's Fields. Charles Jamrach may have been the most notorious of London's exotic animal dealers, but he certainly wasn't alone. His nearest rival was Edward Cross, who ran the Exeter Exchange, a menagerie on The Strand. Closer to home was Wombwell's Menagerie, which also operated in the East End. After Jamrach's tiger escaped, he managed to sell it to Wombwell's for £300 — whose own tiger had escaped in 1839. It's worth noting that exotic animals had been around in London long before Jamrach — the Royal Menagerie at the Tower of London had existed since at least 1235, largely filled by animals given as political gifts. Jamrach's work is so prominent due largely due to his timing — he was working at a time when trade and travel links with other countries were increased. For further reading on Jamrach, we recommend John Simons's The Tiger That Swallowed The Boy.